Michelle Devine is a health and wellness educator in California. Her areas of interest and experience include nutrition, exercise and behavior modification. She has written numerous health articles for various online publications. Devine holds a Bachelor of Arts in psychology and is also an NASM-certified personal trainer. Blue cheese is a strong flavored crumbly cheese that has shades of blue due to its aging process. It is often enjoyed in salads, on hamburgers and crackers and mixed in dips and salad dressings. A serving size of any cheese is 1 ounce, which is about the size of four small dice. This may seem like a small amount but because of its strong taste, it does not take much blue cheese to enjoy its flavor. Blue cheese is not a reduced fat cheese and has about 5 grams of saturated fat per serving. According to the USDA, saturated fats should be limited to less than 10 percent of total daily calories. 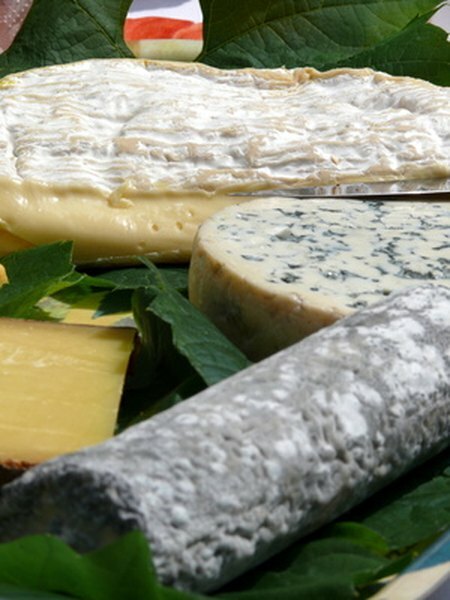 However, since it is also a dairy product made from milk, blue cheese does offer nutritional benefits and can be incorporated into a healthy diet. Protein is the building block for muscles, cells and organs and can be found in a variety of dairy products. The recommended dietary allowance for women is 46 grams of protein per day. One ounce of blue cheese contains 6 grams of protein, which is 13 percent toward that daily goal. One way bones and teeth become strong is by consuming adequate amounts of calcium. This essential mineral cannot be produced by the body so all calcium needs must be met through food. Calcium can be found in dark leafy vegetables and also in dairy products, such as blue cheese. One ounce of blue cheese has about 150 milligrams of calcium. According to the University of Maryland Medical Center, the general recommendation is about 1,000 milligrams each day, so the cheese supplies 15 percent of that. Dairy products are a good source of potassium, which is an important mineral for the body to function properly. It is a vital part of muscle contraction, which aids in heart functions and digestion. The USDA recommends 4,700 mg of potassium each day and 1 ounce of blue cheese provides 73 milligrams, which is about 2 percent toward that goal. Although not considered to be a significant source, blue cheese does contain trace amounts of certain vitamins and minerals. One ounce of blue cheese has 7 milligrams of magnesium, which aids in healthy bones as well as a variety of other functions. It also contains vitamin B-12, which is a B vitamin that helps the nervous system function properly. Small amounts of beta carotene, vitamin D and phosphorous can also be found in blue cheese.